F. Leake’s butcher won the Best Independent Butcher: North East – Innovative Category for its Chicken, Chicken Liver, Leek and Stilton sausage that was created by butcher Nathen Ransley using chicken from Soanes Poultry of Middleton on the Wolds. The event marked the start of the annual sausage week initiative that celebrates and promotes British sausages. 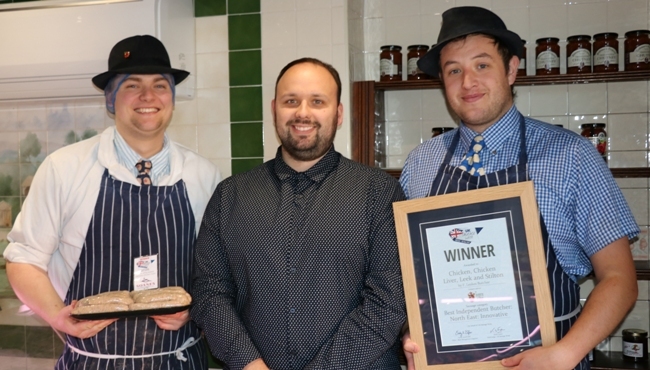 Mr Bollon, who only took over the established butcher’s shop three years ago, said: “We have been so busy over the last three years that we have not entered a single competition and now we have won, at our first attempt – we’re over the moon! Throughout UK Sausage Week, butchers, manufacturers, retailers and associations are hosting their own sausage events, special promotions, competitions and tastings.